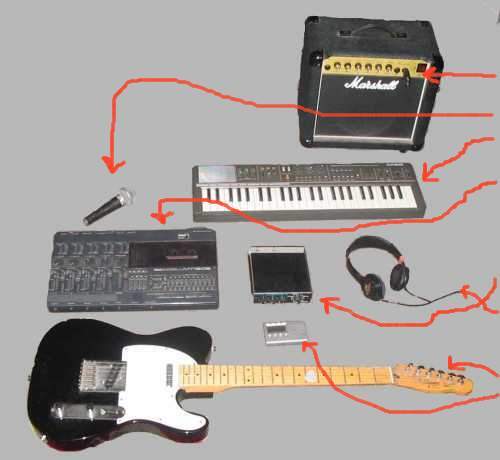 Yamaha MT-120s 4-track recorder, Alesis Microverb 4, JVC HA600 headphones, SM58 mic, Casio Casiotone MT-68, Squier Tele, Marshall amp, small tuner. I had been writing music as a hobby for a few years before Fifth Column. Here's the equipment I was using. Those JVC HA600 headphones aren't that special but I am really used to them. I buy them whenever I see them. If you've sold any on ebay this last decade, it's probably been me that bought them. That's an sm58. Hard to beat. I bought one of the big 1" diaphragm mics but it just wasn't the same. Anyway, once I'd recorded my Fifth Column songs, my musical friends, who were sending lots of demos to London, said my latest songs were better than before and that we should send them south for the record companies to hear. They put me in touch with the people at Domino Records in London, who were enthusiastic and said they'd like to help me get the songs heard by more people. That sounded fine to me. Have a look at the records next.